A U.S. intelligence analysis now suggests that the Islamic State or its affiliates planted a bomb on the Russian Metrojet passenger aircraft, CNN reported. British Foreign Minister Philip Hammond also said that his government believes there is a “significant possibility” that an explosive device caused the crash. 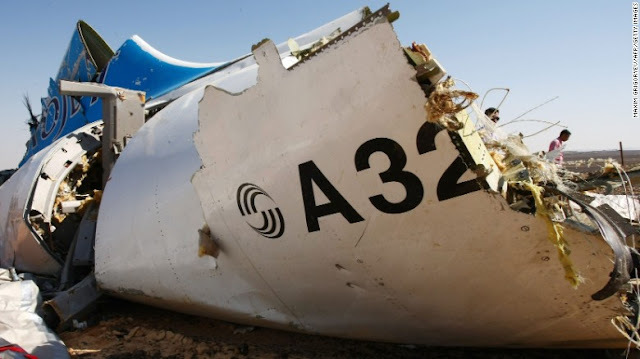 Metrojet Flight 9268 crashed Saturday in Egypt’s Sinai Peninsula after breaking apart in midair, killing all 224 people on board. In an audio message posted on social media tonight, an ISIL affiliate, the Islamic State Sinai Province, insisted that it brought down the plane. But the message did not provide any details on how they brought down the plane, if in fact they did. Meanwhile, Britain and Ireland suspended flights to the Egyptian resort city of Sharm el-Sheikh airport, where the Metrojet took off before crashing over the desert. Egyptian Foreign Minister Sameh Shoukry said he was “somewhat surprised” by the British decision. Photos have emerged of puncture holes on the emergency door and fuselage of the stricken A321.